(L-R) The group of Stork’s Nest attendees, all friends and relatives from Ghana: Irene Ackerson with daughter, Nana; Nana Frimpang with daughter, Zion; Esther Olsiyaa, Ernest Duat with daughter, Janine; Owusu Dangvah, Nana’s mother, and center, Ernestina Berko. Every third Saturday, new and expectant parents congregate at the South Arlington United Methodist Church in Akron. It looks like a big play date, but it’s actually part of a program designed to prevent birth defects, prematurity and infant mortality. The program is Stork’s Nest, where clients earn points for attending educational sessions on preconception, pregnancy, breastfeeding and immunizations. They then use these points to purchase baby clothes. The program has been sponsored by the Akron chapter of Zeta Phi Beta Sorority and March of Dimes since 1997. But talk to anyone involved in Stork’s Nest and they will tell you that the program’s “heart and soul” comes from program coordinator Cheryl Hooks and Akron Children’s genetic counselor Connie Motter. 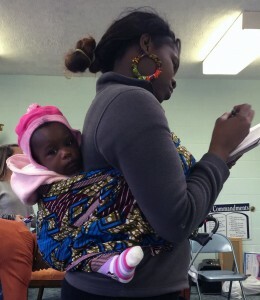 Nana Frimpang – with her baby, Zion – fills out a post-test. Volunteers like Connie and Cheryl plan the monthly topics, line up speakers and oversee the store inventory and purchases. March of Dimes supplies educational materials and small grants. Since the program’s inception, Cheryl estimates that about 500 babies have benefited from their parents’ participation. Diverse topics range from “The Importance of Immunization” to “Men Have Babies Too” and are provided in English and Spanish. 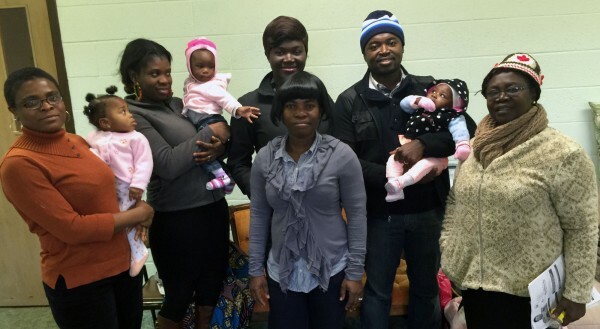 Six clients, all from Ghana, attended the New Year kick-off program on preconception health in January. The topic, led by Connie, was particularly timely since January is Birth Defects Prevention Month. 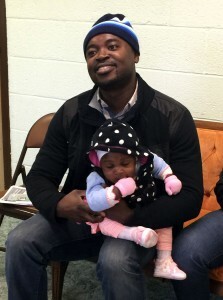 Janine and her dad, Ernest Duat, attended the January Stork’s Nest program. Since all the attendees brought their babies, Connie emphasized interconception care or what to focus on before a next pregnancy. One important step is taking a multivitamin with folic acid to reduce the risk of spina bifida, heart defects and cleft lip and palate. Connie stressed the importance of staying on vitamins throughout your reproductive years and waiting at least 18 months between pregnancies. “I learn something every time I come. It’s good information for my family,” said Ernestina Berko, mother of 2 boys. 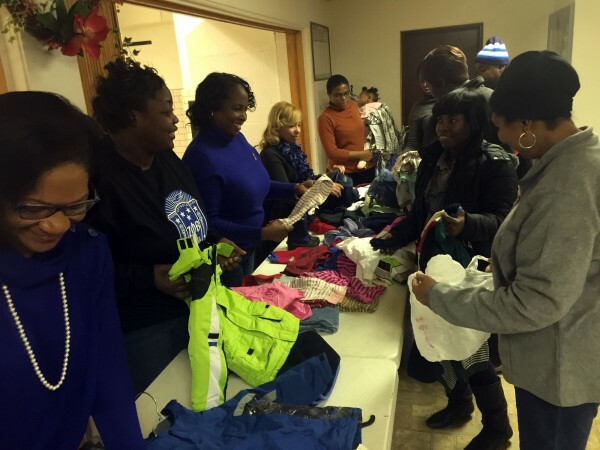 After the program, the clients sorted through colorful pants, overalls, dresses, jumpers, shoes and coats primarily donated from Zeta Phi Beta. Especially popular on this snowy day were the sweaters, boots and mittens. Connie refers to these volunteers as the backbone of the program, while Cheryl shares that Connie has gone above and beyond to keep the program vital for underserved parents in the Akron area. Stork’s Nest volunteers help clients pick out baby clothes. New attendees are welcome to attend Stork’s Nest on the third Saturday of every month (except for July and December) from 11 a.m. – 1 p.m., at Arlington United Methodist Church, 790 S. Arlington St., Akron. Donations of new baby items are also welcomed. “We try to impart the concept that the health of the mother is her whole life course leading up to pregnancy, not just during her 9 months of pregnancy,” said Connie.